With a unique octagonal design, stately roof lantern and 14 meter span the new RHS Hyde Hall Glasshouse provides a truly arresting landmark visible far beyond the new edible gardens. The glasshouse includes two sets of very large doors running from north to south. A substantial greenhouse in the walled garden of a large country estate. Large glasshouses can help you to make the most of the space available to you even in the largest of gardens, where you have a good amount of room to devote to indoor planting and temperature control, while still leaving a sizeable outdoor area. All of our large greenhouses are designed to not only provide you with shelter and a controlled climate, but a fully flexible garden room that can be divided and used in a way that perfectly suits your style of gardening or relaxation. Our large greenhouse range comprises large glasshouses in the traditional Victorian style, our largest made-to-order greenhouses, along with botanic glasshouses, and bespoke freestanding and lean-to greenhouses that can be designed to suit your outdoor space. Interiors can be designed to offer a multi-purpose or multi-zone space, with glass partitions to provide a physical division that will not prevent light and heat from reaching all parts of the structure. And with masonry elements that enhance stability and aesthetic appeal, as well as allowing some of our large greenhouses to be used as orangeries, you can rest assured that your new glasshouse will be standing strong and usable for decades. The Alpine Glasshouse at RHS Garden Rosemoor, featuring a year round alpine plant display. Manufactured to customer specification this Modern Horticulture Glasshouse sits on a low level brick wall. The new Modern Horticulture Glasshouse 7 is a free standing structure with a central entrance. This bespoke glasshouse is part of a new, exclusive project in London’s East end. A free standing glasshouse from the Modern Horticulture Glasshouse range including integrated cold frames in light ivory. A free standing Modern Horticulture Glasshouse for growing and preserving plants. Launched at RHS Chelsea Flower Show 2016 Modern Horticulture 1 is a new concept. A custom Victorian Lodge with two porch entrances in Olive Leaf. A three-quarter span bespoke Victorian Lean to Greenhouse in a kitchen garden. An innovative solution for building a greenhouse on this sloping site. This Victorian Glasshouse includes two internal partitions to divide the growing environment to 3 different temperature zones. 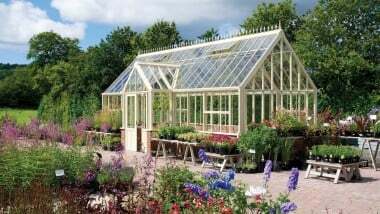 This bespoke Victorian Glasshouse is one of many serving the needs of a large private estate. A bespoke Glasshouse in Forest Green, featuring multiple levels and zones. A bespoke Victorian lean to glasshouse / vinehouse, a replacement for an old wooden greenhouse in a large private estate.